Southern Trend Builders is a full service company specializing in custom homes, remodeling, and light commercial and excavation projects. 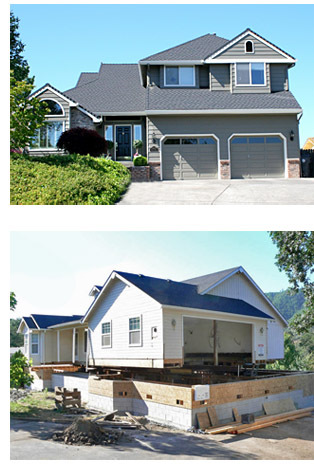 Based out of Jacksonville, Oregon, Southern Trend Builders serves Medford, Ashland, Jacksonville, Central Point, Grants Pass and all surrounding areas. We are experienced in lifting existing homes to add a foundation or in some cases even a new basement, taking any project from conception to a finished product ready for occupancy. We have our own excavation equipment and have been doing all of our excavating work, underground utility installation and final grading on our projects for over 10 years. We are on the job everyday supervising all phases of the construction process, and taking part in the hands on day to day carpentry work on all projects from the under floor framing to the roof and just about everything in-between. We have a fully equipped shop to handle any specialty products that might need to be fabricated for a specific job. We work very close with all of our sub-contractors, most of who have been with us for over 15 years, keeping the lines of communication open through out the project to insure continuity between all subcontractors. We also help to establish communication between our customers with our suppliers and our subcontractors to help in the selection process of colors, materials and fixtures which in turn translates into a smoother running project that stays on time and on budget from start to finish. We would like to be the building company for all of your projects and we will work tirelessly to earn and keep your trust and confidence, so you will only think of us when you or any of your friends are looking for a contractor.
" Commitment to Excellence "